My friend's son turned four today and I was invited to his party. 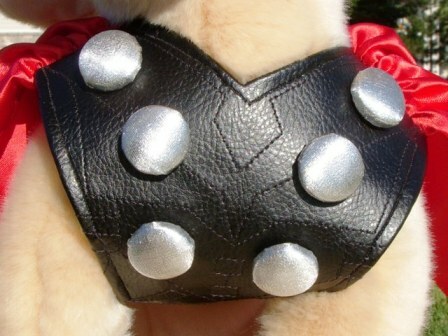 When we asked about gifts, my friend said that he liked puppies and the movie The Avengers. 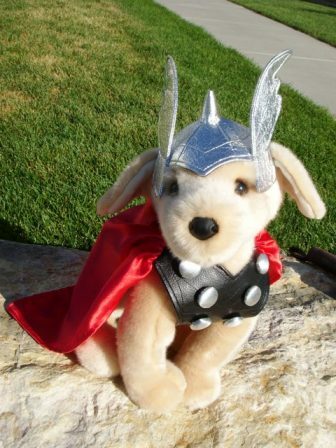 I decided to combine the two and voila, we have Puppy Thor! The stuffed dog is from Cabela's. The outfit was made entirely by me. It took about three days of sewing to finish. I really didn't think it would take that long when I started! I hand-drafted the pattern for the shirt. It's black pleather and, since it doesn't come off, I didn't bother lining it. The cape is satinette, gathered at the shoulders. The buttons are "cover buttons" and are covered with two layers of a semi-sheer silver fabric. I attempted to use the same silver fabric as the helmet but it tore when I tried to attach the button backs. This is the back of the shirt, underneath the red cape. 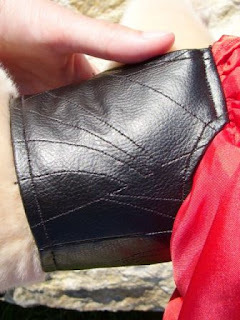 You can see the decorative top-stitching well here. 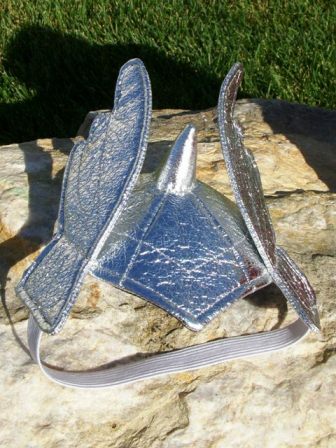 The helmet is silver foil pleather. It is very fiddly to work with and the silver part tears easily. I started with a child's yarmulke pattern on Yakityak.com and shrunk it 75%. 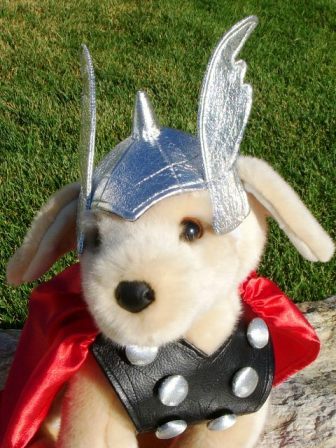 I added the point at the front, the cone on the top, the wing side-shields and some elastic to keep it on Puppy Thor's head. 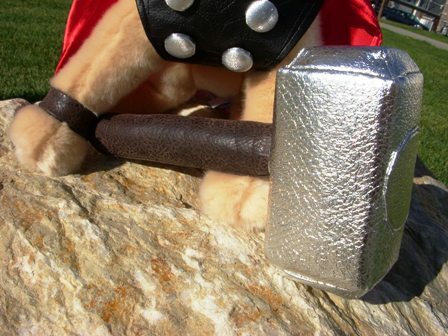 I got lucky and found a half-scale papercraft version of Thor's hammer on Tektonten Papercraft's blog which I was able to modify as a sewing pattern. I also shortened the handle an inch or two to make it more in scale with the dog. 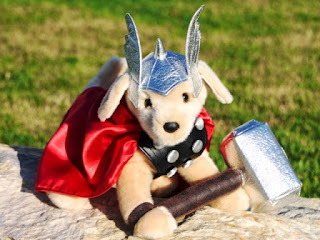 I was very sad to have to give Puppy Thor away, but his new owner seemed very happy to have him!